When I walk down the memory lane, I remember the day I met Justice Soza, when I took my oath as a Judicial Officer. I was with five of my colleagues and after taking our oaths we went to the Judges Institute where we had the privilege of meeting this legal luminary. Before I saw his physical stature his reputation had reached my ears. He put us at ease by asking some questions in a friendly manner. Justice Soza was educated at Maristella College Negombo. In 1943 he obtained the Bachelor of Arts Degree from the University of London and he started his illustrious career as a teacher. In 1951 he obtained the Bachelor of Law's Degree from the University of London. Then he entered the Law College and passed as an Advocate. He was called to the Bar on the April 28, 1948, after getting his initial training under N. K Choksy, KC and he practised for some time in the original civil and Criminal Courts of Negombo and in Colombo. 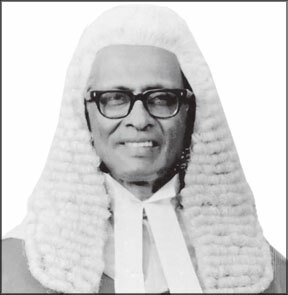 Justice Soza embarked upon his distinguished career on the bench on March 01, 1957. He functioned as a Judge in the capacity of Magistrate, District Judge and a High Court Judge. Thereafter he was appointed as a Judge of the Court of Appeal and on January 26, 1982 he was elevated to the Supreme Court. When he was functioning as a Judge of the Supreme Court, he had pronounced a number of judgments, which are considered landmarks in the development of the law. Justice Soza had a special fancy for Latin maxims which he often quoted in his judgments. After his retirement from the Supreme Court bench, he was appointed as the Director of the Sri Lanka Judges Institute on May 2, 1984. He contributed his vast knowledge and experience for the training of Judges who benefited by their exposure to his scholarship and versatility. There were many Judges who had the privilege and happy destiny to come under his benign influence and get trained as Judges. It is relevant to mention here that we learnt not only how to deal with the intricacies of law but also with the finer points of gentlemanliness. I recall how Justice Soza enlightened us convincingly on Partition Law by citing “Somawathie vs Madawala, a landmark judgment by His Lordship. When it came to the interim injunctions, Justice Soza introduced the guidelines for the granting of an interim injunction in the case of Felix Dias Bandaranayake vs The State Film Corporation. I cannot resist the temptation to mention the pains taken by Justice Soza to imbibe in us the longest chapter in the Civil Procedure Code. We appreciate the way he tolerated us and very patiently, repeated the procedures on execution of decrees and drove the relevant points succinctly. It reminds me the way Justice Soza explained and analyzed another landmark Judgment of his, Leechman and Company vs Rangalla Consolidated Limited, which refers to garnishee orders. It is no exaggeration to say that, talking to him is an education itself and he was a living embodiment of gentleman par excellence. The Buddha in His wisdom said that a real Buddhist would not hurt the feelings of others nor would he conduct himself in a manner to provoke his associates. In my assessment Justice Soza was a fine exponent of that saying. While functioning as the Director of the Judges Institute, Justice Soza edited the first publication of the Judges Journal in 1991, which was a great contribution to our legal literature, so much so that no less a person than Lord Denning paid a handsome tribute to him in that regard. Unfortunately the Judges Journal ceased to be published, in spite of its immense value. Nevertheless the Judges Journal has not diminished as borne out by the fact that the Judges as well as the Lawyers make use of it even at present. By a quirk of destiny when I became the Secretary of the Judicial Service Commission, I got the opportunity to revive the Judges Journal after 19 years with the permission of the Judicial Service Commission. It is in the fitness of things to honour this great Luminary in appreciation of his yeomen service to the Judiciary of this country. Even belatedly the Judicial Service Commission together with the Judicial Service Association had made arrangements to felicitate Justice Soza and the revival of the felicitation issue of the Judges Journal was respectfully dedicated to Honourable Justice Soza on that occasion. He was a virtual Patron Saint of the Judiciary to whom we looked up for guidance. Even after his retirement from the directorship of the Judges Institute, Justice Soza continued to assist the judges to untie the legal knots and was available to unravel them over the phone. Justice Soza's immense service to the legal profession cannot be denied and still less obscured. Over the years Justice Soza has been the virtual authority on the decorum, dignity and the propriety of the conduct of the fraternity of Judges. With his demise a pall of gloom has descended upon the legal domain. By extension, it is said that great Judges leave their foot prints on the sands of time for the others to follow them. That is the invaluable legacy Justice Soza has left for the present generation of the legal profession. We have to scan the horizon asking ourselves the question whence can we see one like you again. A large number of the legal profession assembled to pay the last respects to this most eminent legal personage. Although his legal brains have ground to a halt the sparkle of it would remain undiminished.